Like what you see? Share us with your friends by putting our button on your website or blog! We really appreciate your support. Thanks! You are the winner of the lil Joey 2-pack giveaway!! 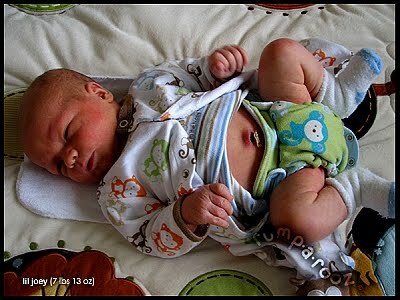 1) Prefolds with Thirsties Duo Wraps, Size One (6-18lbs) - Newborn babies and young infants use up to 12 diaper s a day! There is no more economical way to cloth diaper your tiny baby than using prefold diapers. You can fold them down to the exact size needed, and prefolds are very absorbent. The Thirsties Duo makes the perfect compliment to the prefold. The leg gussets keep in any messes that may escape the prefold. It is even smaller than many x-small covers out there, with the advantage of growing with your baby! 2) Kissaluvs 0's (5-15lbs) - The thick terry pile of the KL0's make it a perfect diaper for stopping those newborn poops in their tracks! The size o snaps down in the front to help keep the diaper away from baby's healing cord stump. They are more pricey than prefolds, but do a better job of keeping messes in the diaper and off the cover. 3) Lil Joey (4-12lbs) - This diaper is a special all-in-one designed with the intent to fit babies before a one-s ize option will work. The Lil Joey also snaps down in the front to protect baby's healing cord stump. This diaper has leg gussets which contain messes really well. It is also a great choice for parents looking for a one step diaper change. It will even fit your preemie! Are you building your newborn stash? Giggle Britches can help! 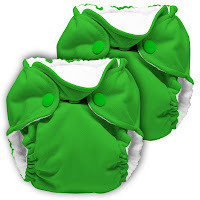 I am giving away one Lil Joey 2-pack in a gender neutral color!! Read on to learn how to enter. Hurry, giveaway ends 8/10/10! 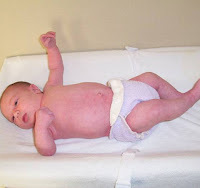 (1 entry) Tell me what your favorite newborn cloth diaper is (or one you want to try) and why. (1 entry) Follow @cdretailercoop and @GigglBritches on twitter and tweet this giveaway. Please tweet, "@GigglBritches and @cdretailercoop are giving away a lil Joey 2-pack! 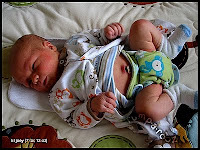 http://bit.ly/dieNhh #clothdiapers #giveaway" Leave a comment with a link to your status. (1 entry) Follow this blog. Leave a comment. (1 entry) Grab our button and post it on your blog. Leave a comment. (2 entries) Blog about this giveaway and link to it. Post a link in your comment (leave two comments). (2 entries) Post about this giveaway on a message board or forum. Post a link in your comment (leave 2 comments). (1 entry) Like Giggle Britches on Facebook. Leave a comment. (1 entry) Like Cloth Diaper Retailer Cooperative on Facebook. Leave a comment. I want to try the lil Joeys! I would also love to try the kissaluvs fitteds, I havent done fitteds yet. Lil Joeys would be great since they are so easy! I want to try the Little Joeys! Heard great things about them. I 'like' Giggle Britches on facebook. I 'like' Cloth Diaper Retail Cooperative on facebook, too. I'll have to say Lil' Joeys as well! The regular sized Rumparooz are SOOOO nice - and the newborn size look like they would be just as deluxe. I "Like" CDRC on FB. I "LIKE" Giggle Britches on FB. I've been wanting to try the Thirsties! I want to try the Sustainablebabyish fitteds.We used AIO or pockets with our other kiddos and I want to give fitteds and covers a try. Plus the Sustainablebabyish ones come in great vivid colors! I'm due in September, so I haven't tried them yet, but I got some of the newborn Real Nappies covers to use over prefolds. I'd also like to try the Lil Joeys, but they are expensive! I've never heard of the Lil Joey newborn, I'd love to try one, I'm building a newborn stash while we TTC. I Would Love To Try The lil Joey. Im So Excitied About Getting My Collection Started And This Lil Joey Looks Like A Perfect Way To Get Started. I want to try some fitteds or newborn all in ones to supplement the prefolds and covers in my growing stash for some more convenient options for grandma or going out. Adding second entry for Judy. Thank you for "liking" CDRC facebook. I already love the lil' joeys. They're cute, functional, easy, and they really fit newborns! I like Giggle Britches on FB. I like CDRC on FB. Our favorite newborn diaper was prefolds, but that was before I got submerged in the world of cloth. I'm HOPING my bff will try cloth with her baby due in Oct so I can get her some Lil Joeys. With our next baby, I would love to try the little Joey's. We do love prefolds and covers for the newborn stage too. I've only used one size dipes and Katydids are my NB favorite. I actually want to try the little Joeys you're giving away! They're really cute and when I have my second child someday, I will very eagerly put these on him/her. We used disposables on our daughter because I was new to cloth then, and didn't know about newborn sizes, but with the next one, it's cloth 100%. I'd like to try little joeys! Cute fabrics. Follow this blog... love all the great information and who doesn't love giveaways! Fan of CDRC on FB! I would really love to try the prefold fitteds. we borrowed swaddlebees newborn fitteds and used the X-small Thirsties covers when our baby was a newborn and they were great. the prefolds were good too but a bit bulky (perhaps there is a smaller size prefold than the size we have though?). I'd love to try the Lil Joeys when we have another baby! We're still waiting on our newborn, so I don't have a favorite yet. I want to try Lil Joey, because a friend of mine really recommends them. I'd love to try the Lil Joeys on a newborn. I already have regular Rumparooz in my stash! Thank you for the giveaway! I like Giggle Britches on Facebook. I like Cloth Diaper Retailer Cooperative on Facebook. I've cloth diapered two as newborns. With the first I loved Kissaluvs size 0 and Thirsties XS wraps. The second was smaller and the Kissaluvs and Thirsties XS were a bit too big, so I used newborn prefolds and Bummis Super Brite covers. I'm a Facebook fan of Giggle Britches (Jodi J). I want to try the Nifty Nappy's Bitty Bums. I love their one-size fitted on my oldest and thing these should be perfect on my littlest one. I like Giggle Britches on FB!. I like the Mini Happy Heiny's for my newborn. We didn't start CDing til 3 weeks, so I never bought any newborn diapers. I can't wait to with the next one, though! Prefolds and flats with the Thirsties Duo are probably going to be my choice. Although I might have to splurge and get some Lil Joeys - SO cute! I would love to try the fuzzibunz newborn diapers. =) I love fuzzibunz! I want to try these diapers so bad! I love the original RAR and so this is just the next step! I don't have a favorite newborn diaper since I've never cloth diapered a newborn. I have a baby arriving in 6 weeks and these Lil Joey diapers have been the ones I've wanted to try! for a newborn diaper I would love to try the little joeys but I also think the applecheeks size 1 envelope covers would fit great. I haven't used cloth yet on a nb, but I have prefolds, bum genius xs bamboo fitteds & thirsties xs covers in my stash for my new little guy on the way!! My favorite diaper is the bumGenius, but I'm hoping to try the 4.0 version soon!!! They're my favorite because they're easy to use, fit well and usually don't leak. I want to try the Rumparooz little joey's because I have heard such good things about them and their awesome leg gussets. I've never cloth diapered a newborn before and I've honestly wanted to try the Lil' Joey's the most! I think they look awesome! I don't know why more diapers don't catch on to the gussets idea! Since I'm new to cloth diapers, I haven't known of a lot of other options, but I also thought the Kissaluvs newborn fitteds might be another good option? Thanks for this giveaway! I have really been wanting to try the Lil Joey actually! It's so cute, and I love that they offer so many color and print options! I want to try Little Joey's because I have heard such great things about them fitting newborn babies so well, and love the fact they have some many colors to chose from! I'm a fan of Giggle Britches on fb! I'm a fan of CDRC on fb! Review of Fresh Moon Mama Pads & a Giveaway! !